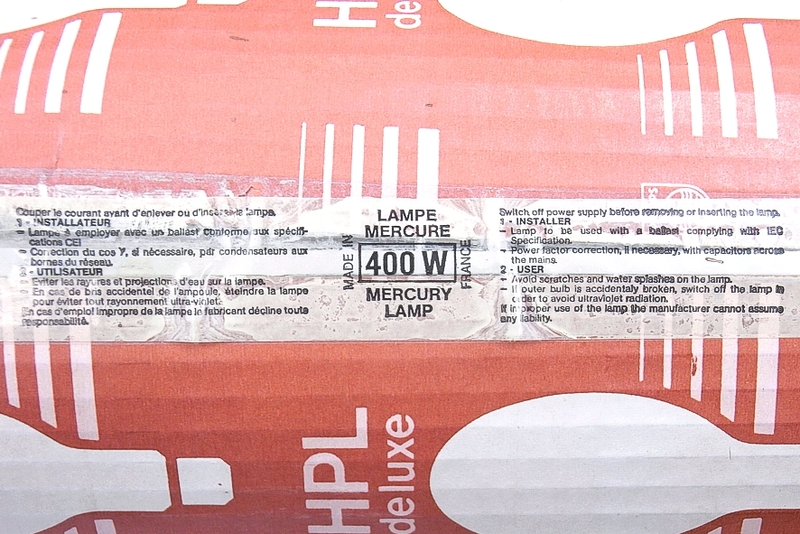 Philips developments in mercury fluorescent lamps began in 1937 with the HPL300, employing sulphide phosphors to increase red ratio from 1% to 4%. In 1950 these were replaced by Philips' arsenate phosphors in an improved HPL lamp having 7.5-9% red. This was again superseded in 1968 (HPL-N) based on Sylvania's 1964 invention of the vanadate phosphors, featuring 11% red, 10% higher efficacy and a whiter light on the blackbody locus. Philips later made a further improvement by replacing part of the vanadium with phosphorus and boron to achieve 12-13% red. 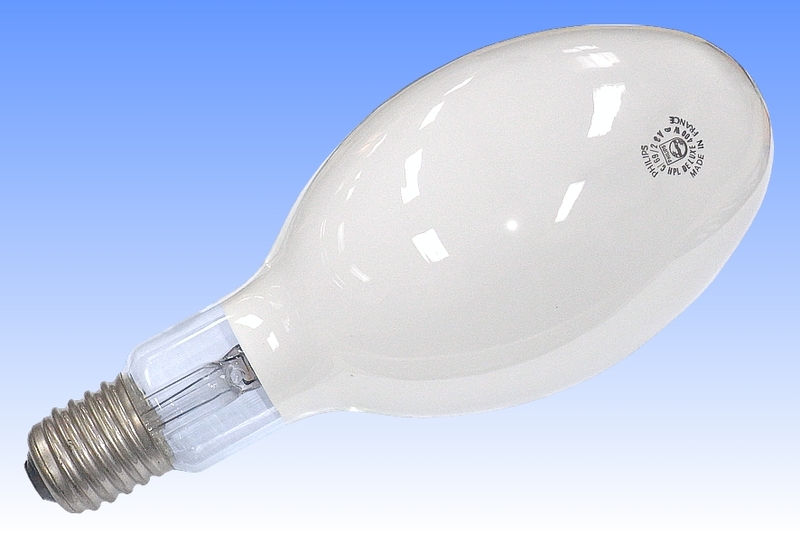 The HPL-Deluxe lamp was developed in 1972-73 to satisfy market desires for a warmer colour for indoor lighting. It delivers 3300-3700K with 14-16% red (depending on power). The principal difference is its coarse grained yttrium vanadate, the average particle size being increased from 1.8 to 6.8 microns. Owing to the fact that there are fewer boundaries between individual grains, scattering losses are reduced and efficacy increases. 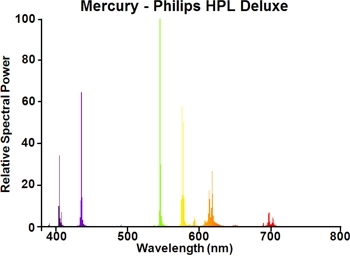 Deluxe lamps partially offset this by employing a coating three times thicker than normal, and due to the greater phosphor weight a greater conversion of the mercury spectrum into red light can be effected. A small improvement is achieved with activators of Terbium and Gadolinium in addition to the usual Europium. One small drawback of this approach is that the net light colour sits just below the blackbody locus and is slightly pinkish. In 1983 this problem was solved in the HPL-Comfort lamps which feature a blend of the former deluxe phosphor with Ce:YAG, whose small blue emission corrects the colour point back onto the blackbody locus. 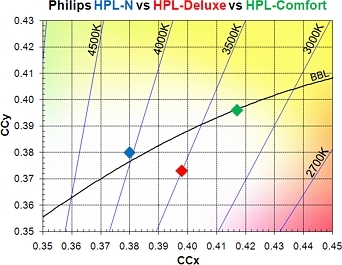 This development swiftly rendered the HPL-Deluxe lamps obsolete. References: 1) Philips Training Manual MTO Turnhoutlampen, Hogedruk-Kwiklampen, Van der Stap & Goethals, 1986, pp.11-12. 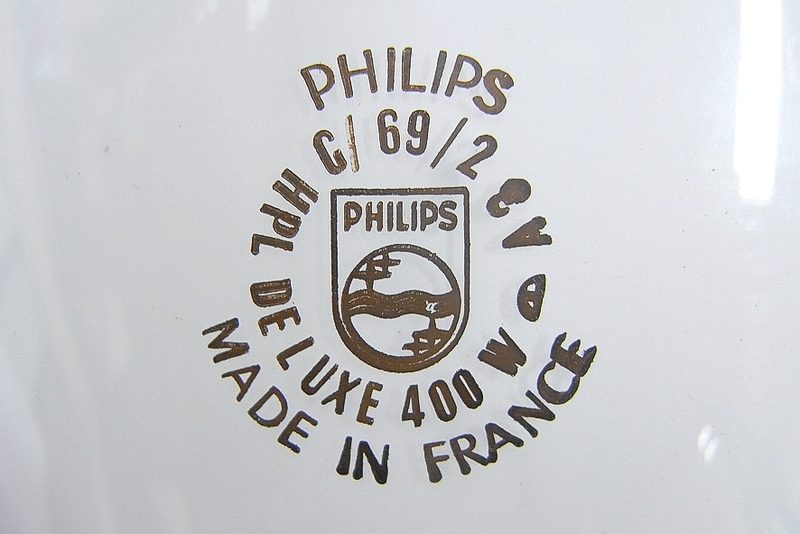 2) Philips Training Course HTO High Pressure Gas Discharge Lamps, pp.35-36. 3) Philips NL Compact Ligting Catalogue, April 1981. 4) Philips UK Comprehensive Catalogue, 1982.